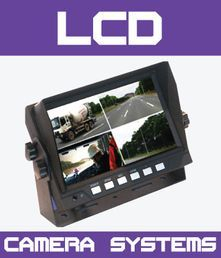 Available with 1, 2, 3 or 4 High resolution camera’s, these systems will cover any blind spots you have on your equipment. The camera’s have IR night vision of up to 10m and are dust/waterproof rated at IP69. The 3 and 4 camera systems have built in Quad function giving you 1, 2, 3 or 4 images on screen and picture scrolling, while the 1 and 2 camera systems have picture scrolling and allow you to swap from camera 1 to camera 2 via the display screen. The display screen is also available in 5.6 inch. The cables have “o” ring weather proof connections and are 20m long. 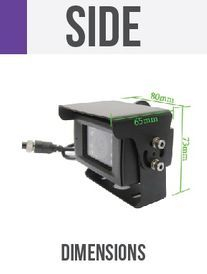 Options include, Waterproof monitors, trailer connection Kits for 1 to 4 camera’s and 5,10 and 15 meter camera extension cables. Custom length cables available by order only. Coming soon, new seed and super box cameras. Cameras: Sharp 1/4 CCD 18 LED IR 10m night vision.A sunshade, water proof rating of IP69 and a 50G shock rating. Monitors: Quad function monitor with split screen and picture scrolling for 1 to 4 cameras.A sunshade and remote. 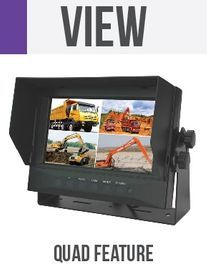 Standard function monitor with picture scrolling for 1 to 2 cameras. A sunshade and remote & Waterproof monitors. Cables: 4 pin, 20m with 'o' ring weather proof connections. 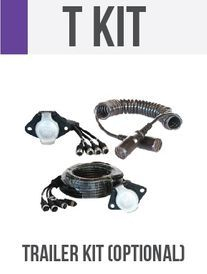 Options: Trailer extension Kits for 1 to 4 cameras and extra camera extension cables in 5m,10m and 15m. Water proof monitor, available by special order only.